As most companies out there already know, getting your customers engaged online is crucial for businesses today. In fact, online shopping is becoming so prevalent that some people choose it over traditional shops. And that even happens if the store is just around the corner from them. It is simply too convenient to order things online. And this is important for both new companies and the ones who have been around for a while. Even companies with incredible histories have to adapt and join the online competition. However, to be able to set up an online store, you have to provide security to transactions. And, in order to be capable of handling payment card data, you have to be Payment Card Industry Data Security Standard compliant. Or, PCI DSS for short. In essence, this means that you have to be compliant with the 12 requirements of this standard. It came to be when the most important financial institutions chose to work together and define the standards. The PCI DSS represents the minimal set of measurements set up to protect the sensitive information. If your business does not comply with the standards, you risk receiving huge fines. But, more importantly, you can lose the credit lines and loyalty of your customers. Not to mention legal costs that could come up in a case of a security breach. The goal of PCI DSS compliance is to create a secure environment for card payments. But this does not only include the protection of customer’s data at the point of sale. It also entails the protection during the storage and transmission in a cardholder environment. And the point of these measures is to do a lot more than just create a secure environment. It allows acquirers and customers to do business with the PCI businesses. So, having a proof of the PCI DSS compliance does a lot more than just protect the card holder’s details. It also safeguards the reputation of any an entity that does business online. After all, if you do not comply with the PCI standards, it will make your business a lot more difficult to run. Failure to comply will damage your company’s reputation and hold the potential for success back. Not to mention that the data can be compromised, and, if it comes to that, your entity is as good as dead. So, if you want to make sure your company can comply with the Payment Card Industry Data Security Standard, double check if your host provider meets said standards. And only do business with host providers that do. To make it easier for you, we will present our top-ten list of PCI DSS compliant providers. This web host company was founded in Sofia, Bulgaria way back in 2004. Which means it has been around for a while. This web provider is currently servicing hundreds of thousands of domains around the world. The company itself has over four hundred employees. A really attractive feature is that SiteGround allows you to choose the data center that will host your website. The choices you get are to base the hosting in Chicago, Amsterdam, Milan, Singapore or London. So, if you have concerns regarding data privacy, you can go with a European server. Or, if you have a lot of traffic coming in from Asia, you can go with the Singaporean one. It offers multiple different types of PCI compliant hosting and various tools you can use to enhance website performance. The basic offer will get you a website that is suitable for about 10 thousand visitors per month. Their most affordable plan will cost you €7.95 per month. And will include 10GB of storage, all the emails you can send (unlimited), and CloudFlare support for performance and security. On the flip side, you can go with their most expensive plan that will cost you €336 per month. But it will include 2 Intel Xeon E5-2620 CPUs, 16GB RAM, and 2TB storage. However, the bandwidth is limited to 10TB. We can definitely say that SiteGround is a very good choice. It is not too expensive (especially with their shared plans) and offers a wide variety of packages. It is not perfect though. The main issue many run into is that they do not offer monthly options for shared hosting. Thankfully, they have a trial month you can test. But, once that is over, you can sign up for a minimum of one year. And their plans could do with more storage. Overall, it offers really good service and strong security. So, you can safely host your PCI website with them. Another reliable hosting company you can trust your website with. InMotion Hosting has been around since 2001. And they boast themselves to be the perfect choice for businesses and people with experience. Their servers are based in the United States, and you can choose if you want your website to be hosted on a server on the East Coast or on the West Coast, and it doesn’t cost extra to do so. They have various plans. These range in price from $7.99 for a starter shared plan to $589.99 for the most expensive dedicated server. The cheapest shared hosting will allow you to have up to 2 websites, unlimited disk space, bandwidth, and emails. And the most expensive dedicated server comes with Dual Intel Xeon CPU E5-2620 v4, 64GB DDR4 Ram and 3x1TB SSD of storage. The first thing we have to notice is that the servers are in the US. And, while that comes with obvious advantages regarding speed, it has its downsides as well. They are less than perfect when it comes to speed if your audience is international. Unless, of course, you are willing to spend quite a bit of money. And their plans are quite costly too. Sure, they offer discounts, but they usually only work if you take a yearly plan. Which is relatively common as a practice, but you will definitely want a discount on their prices. 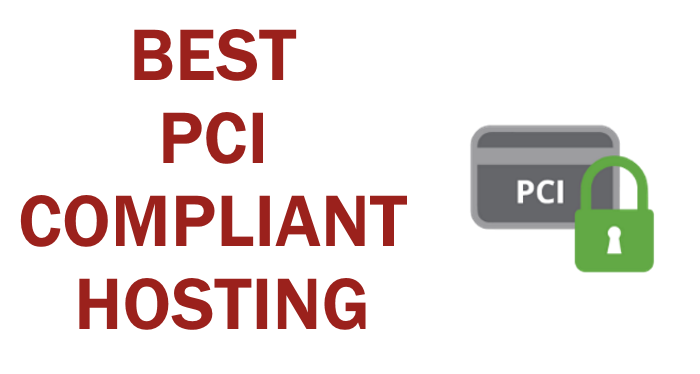 With it, they are a great choice for your PCI compliant hosting provider. If you want to start your online business with a host that is famous as one of the best employers in Texas, this company might be the best choice for you. However, that is not their only quality. Since they are the first company to offer fully managed WordPress hosting, you can rest assured that you will have an army of WordPress experts there to help you out when you need it. If you are a beginner that needs a lot of help to get the company off the ground, this is a good choice. They will manage your WordPress website with utmost care and expertise. This particular form of WordPress hosting comes with very interesting advantages. Instead of focusing solely on the specs of the server you purchased, they will help you with development. You don’t want your website’s design to lag behind your growth. It can cause a lot of issues with speed. Their prices range from $29 to $249 per month, which is definitely not cheap. However, the management they offer is top-notch. The personal offer for 29 dollars, will get you 10GB of local storage and free SSL certificates. It can handle 25 thousand visits per month. The Business offer will cost you 249 dollars. WIth it, you will have 30GB of storage and up to 400,000 visits per month. They do not disclose the hosting specs they offer. One thing we can say for sure is that this hosting provider is a great choice for beginners. The management is high-quality and they are always there to help. However, they are not quite perfect. The services are rather expensive and there is a lack of features you could expect. They do not have Windows servers or domain names in their offer. Overall, a really good choice for a young PCI business, but has a few flaws. Is your PCI business boasting the eco-friendly nature of your work? Well, in that case, GreenGeeks is the perfect choice for you. Ever since the founding year of 2008, this company has been trying to help the ecosystem. And they did a marvelous job. Every year they offset over three times the energy they use. This means that their carbon footprint is not only zero, but they also negate the negative effect of two other companies of the same size. So, if your company prides itself to be eco-friendly, this is a great, powered-by-wind choice for you. They offer servers in the USA, Canada, and Netherlands. They are easy to use and they offer various plans that can fit anyone’s paying capabilities. The prices can go as low as $9.95 for a shared plan (which can be on sale for only $3.95). But also, as high as $439 for a dedicated server. The cheapest plan will afford you unlimited SSD space and transfer, unlimited domains, free domain name registration and website transfer service. The most expensive dedicated server will cost you 439 dollars and it includes Xeon E5-2620 CPU, 16GB RAM, and 2x500GB SATA drive. If you, yourself, worry about the effect you have on the environment, this is the perfect choice for you. And, not only that, but it will help your brand as well. And the offer is rather good too. You can choose servers on two different continents and rely on their customer support for help. However, they are not perfect. The performance could be significantly higher and the discount comes with a catch. Namely, you have to purchase 3 years of hosting to get that $3.95 price. The GreenGeeks.com is a good PCI compliant hosting choice if you want to stand out due to eco-friendly attitude. Liquid Web Incorporated was founded way back in 1997 in Lansing, Michigan. And having over 20 years of experience in web hosting is something not many a provider can claim. If you have a big business you will want a strong service to host your website. And Liquid Web is one of the most reliable ones out there. A quick glance at the list of companies that chose them as their provider is all that you have to see to be sure it can handle your website: Porsche, National Geographic, Home Depot, and many others. Liquid Web comes with an offer of a range of VPS and dedicated servers you can purchase. And the prices range from $59 per month for basic VPS to $599 for their strongest dedicated server. The cheapest offer includes the VPS with 40GB of space, 2GB RAM, 5TB bandwidth and Linux only servers. The most expensive dedicated server comes with Intel Xeon E5-2650 v4, 32GB RAM, 2x480GB SSD drive and 1TB SATA backup. LiquidWeb is an excellent choice for any a PCI company. And, by their famous clients, you can see that they can definitely handle any and all websites. They are very flexible and offer tons of various features. Not to mention that they have really good customer service. On the flip side, they are rather expensive and do not have shared hosting plans at all. They are a good choice, but you could get similar PCI compliant hosting for a fraction of their price. Wix company was founded in 2006 in Tel Aviv, Israel. It quickly became famous for the ease of use and design. Not to mention that huge marketing campaigns definitely paid off. Various celebrities were promoting it at times. The list includes Jason Statham, Heidi Klum, and even Wonder Woman herself, Gal Gadot. But there is more to them than just promotions. Wix.com offers such a good website builder that many forgot that it also offers web hosting. For only $4.50 per month, you will be able to enjoy their cheapest offer. However, it is not easy to locate on their website. For 4.50 dollars, you will get 500MB of storage and 1GB bandwidth, but, it is not ad-free. The most expensive plan is only $24.50. It provides you with 20GB of storage and unlimited bandwidth. Wix.com offers one of the best free to use website builders out there. Of course, it lacks certain creative possibilities, but everyone can use it. This alone makes it great for those who want to invest as little as possible into their website. Founded in 2008, this hosting company offers perfect PCI compliant hosting. They are fast, reliable, and they specialize in Magento hosting.They own 8 data centers and offer the highest standard possible. They offer upgrades for every server you purchase, so a lot of customization is possible. Their offers differ significantly, and their prices range. Their basic offer on SSD shared is 14 pounds per month, and within that, you get very little – 900MB SSD, free Magento support, 3GB bandwidth, PCI compliant hosting, 5 email accounts, 1 MySQL database, and 1000 Mbps port speed. But, when you look at their dedicated servers, you can see that they also offer some serious power – their most expensive plan is MDS4, and it costs 580 pounds per month. It comes with CPU that is 40 x Intel Xeon 3.1Ghz, 128GB RAM, 2 Intel XEON e5 processors, 4 x 2TB disks, unlimited bandwidth, cPanel, and a whole bunch of software options. If you’re looking for a PCI compliant host that has a tier 4 data facility, full management, and Magento support, look no further. On the other hand, if you don’t have Magento, they won’t be the best choice. And, they have some serious flaws – their plan selection can be rather confusing, and they offer no money back guarantee whatsoever. Ever since 2009 Shopify has been providing various e-commerce solutions to their clients. Shopify makes sure that you have everything you require to sell your products online. They even offer a “Buy” button that allows your customer to purchase your products anywhere online. Shopify comes with three offers. And all of them boast that they have everything you will ever need to run your business. The basic offer will cost you $29 while the advanced one will be as much as $299 per month. While we couldn’t locate the specs, we can see that all offers come with no storage limits. The main differences lie in various features they offer, like a third party calculating your shipping rates. Shopify is definitely an excellent platform that offers everything a new business owner needs. However, their plans are not exactly flexible and finding actual details about their hosting was next to impossible on the website. Not to mention that you will have to pay additional rates that might come as a surprise. So, is Shopify a good choice as your PCI compliant hosting provider? They definitely make it easier and more accessible. But, if you have the knowledge to set everything up yourself, you might prefer a more affordable option. BigCommerce is a lot more than just a hosting website. In fact, they are a leading e-commerce platform that lets you manage your business and grow your sales as well as host the website. The company has been founded in 2009 and the headquarters are located in Austin, Texas. And the list of its famous users will certainly impress you. On that list, you will find Toyota, Kodak, and even Martha Stewart. When it comes to their web hosting, you will love the features they offer. However, you should note that they are not very flexible with their plans. Namely, they offer three standard pricing plans that range from $29.95 to $249.95 per month. The cheapest plan comes with unlimited storage and staff accounts. It also comes with all available sales channels. However, only the most expensive plan can cover yearly sales that go over 150,000 dollars. One thing their servers boast is unparalleled security. Not only do they offer multiple layers of security and DDOS protection, but they also come with their own PCI certificate. They might be the perfect choice for anyone trying to set up a PCI compliant hosting. This company has been consistently operating as one of the best offshore hosting providers around. AbeloHost operates from the Netherlands and they really have an incredible customer service. They offer various plans so you should find one that fits your needs and resources the best. They have offers for beginners and big businesses alike. Their basic shared plan (Pro V1) will cost you only €5.99 and it is well worth it. With the basic plan you get 50GB bandwidth, 10MySQL databases, integrated cPanel, DDOS protection, one-click setup via WordPress and many more features. And the bandwidth is unmetered for all non-shared plans. You can even get a powerful dedicated server for €120, which is probably the lowest the price can go. The most expensive plan they have will cost you €229.99 and it is a VPS plan. That plan comes with a 480GB SSD, Intel Xeon E5 (10 cores), 32GB RAM, and a 1 Gbit port. If you want a great customer service, an offer with plans for anyone’s needs, and incredible prices, AbeloHost is the best choice for you. And, you can even get a yearly discount on an already unbelievably low price. They even have a 30-day money back guarantee. Definitely one of the best choices for PCI compliant hosting.